On 13th May 2013, new 5 car 377/6 unit 377601 was delivered from Derby Litchurch Lane to Wembley. The following day it was moved onwards to Stewarts Lane. 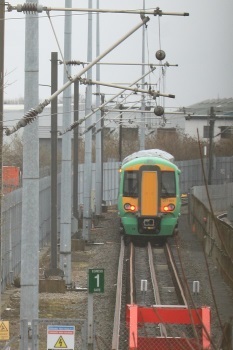 The unit was delivered in unfinished livery - note how the light green circles are not complete. The unit has no seating yet and will be subject to extensive testing. Further deliveries are expected most weeks until the entire fleet is delivered. On 13th May 2013, 377601 is seen at Derby in the consist of train 7Z67 Derby to Wembley. Note the incomplete livery.